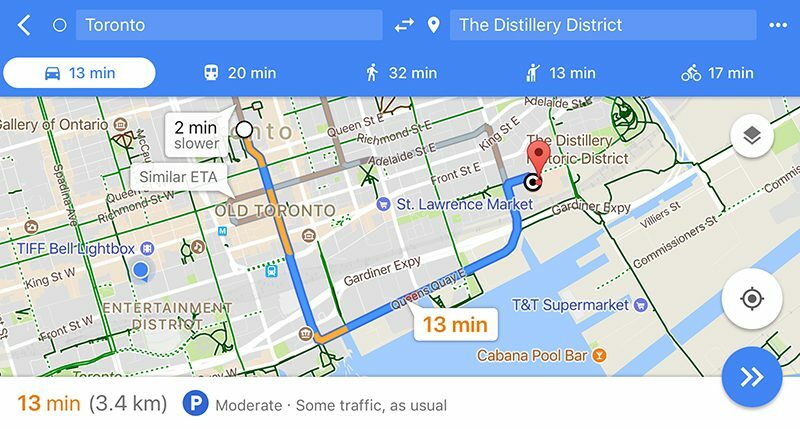 Google today announced its "parking difficulty" indicator in Google Maps for iOS and Android will now appear in 25 additional cities around the world. The feature was previously available in the United States only. The simple feature shows a "P" icon with a difficulty level such as "moderate" or "limited," based on how easy it will be to find parking at the destination entered. The feature is based on historical parking data and machine learning. Google Maps is available for free on the App Store [Direct Link] for iPhone and iPad. I just need apple to get driving directions accurate and smart and cover all major markets for public transportation. And this is exactly the area where they still fail spectacularly. No public transportation in an international hub of Geneva, Switzerland (Google had it for years) and plain wrong old road layout 10 miles away from it in France, despite five (!) error reports from me for the same spot over the last year (!). Waze & Google, meantime, both have it spot on and Waze had it right first, within weeks. So I use Waze for driving and glance at Apple Maps from time to time hoping they would have caught up. This can be pretty useful. I never know how much time I'll have to spend circling around streets to find an empty parking spot. Sometimes there are many empty spots, sometimes I have to give up after 40 minutes of unsuccessful searching and just go somewhere else. It's different for every part of town, at every time of day, and I don't know them all by heart. Though, it can easily be estimated from traffic. If there's heavy traffic, you bet the parking spots are all taken. What I wish they included is the price of parking at each time of day. This is readily available online and would be super handy to have directly in Google maps. "If you park here, it will cost this much per hour until 18:00 and you can't stay for more than 3 hours." that would save a lot of Googling each time. Oh and how about a way to pay for your parking ticket from Google maps? Automatic zone recognition, time calculation, etc... There are some apps to do it but they take a bounty. I bet Google could beat them.